As we approach our community second-night seder at CBI, I thought it might be useful to share a few of the melodies we’ll be using that night. Enjoy! This is the melody we’ll use to sing the steps of the “order of the seder.” We’ll sing it each time we come around to a new step in the order, so by the end of the night, everyone will know it well! This setting of psalm 126 is often sung before the Birkat HaMazon, the Grace After Meals. Here are two verses from psalm 118, sung as part of Hallel, the songs of praise after the meal. Here are both verses of this beautiful song which anticipates the return of the prophets who will herald redemption. Here’s the very beginning of Had Gadya, “One Lone Kid.” With each verse, there are more words and it goes faster and faster — but this is how the song begins, and how each verse ends! Don’t miss our second-night community seder! Songs! Guitar! Good food! Friendship! Poetry! Stories! This year we’ll use a special abridged CBI edition of the Velveteen Rabbi’s Haggadah for Pesach. Please join us. Be sure to pick up a copy of the new Berkshire Jewish Voice! Volume 20, No. 5 — the March 26 – May 5 issue — features a Rabbi Reflections column by Reb Rachel. And in case you don’t have your copy nearby, you can read the whole issue online; and/or, here are those reflections — reprinted from the new BJV, with gratitude. We’re entering my favorite part of the Jewish year: Pesach and the counting of the Omer. I love the story at this season’s heart. Once we were slaves, and now we are free. Once we were in Mitzrayim — the Narrow Place — but the Source of All lifted us out of there with a mighty hand and an outstretched arm. Once our lives were embittered with hard labor, but now our hearts are expansive — and in our exodus from that tight place into freedom, our national identity was formed. The story has great power. But in some way even more powerful, for me, is the way our community has clung to this story as the central narrative of our peoplehood. We are the people who understand ourselves to have been brought out of Mitzrayim, out of slavery and into freedom, and it happened not only “once upon a time” (if it even happened in historical time at all) but it continues to happen now. Each of us, tradition says, must see her or himself as though we had been brought forth from there. It’s almost April, so here’s the schedule for who’s leading which services here next month. Friday April 6: no potluck because it’s the first night of Pesach. Pesach is on its way! 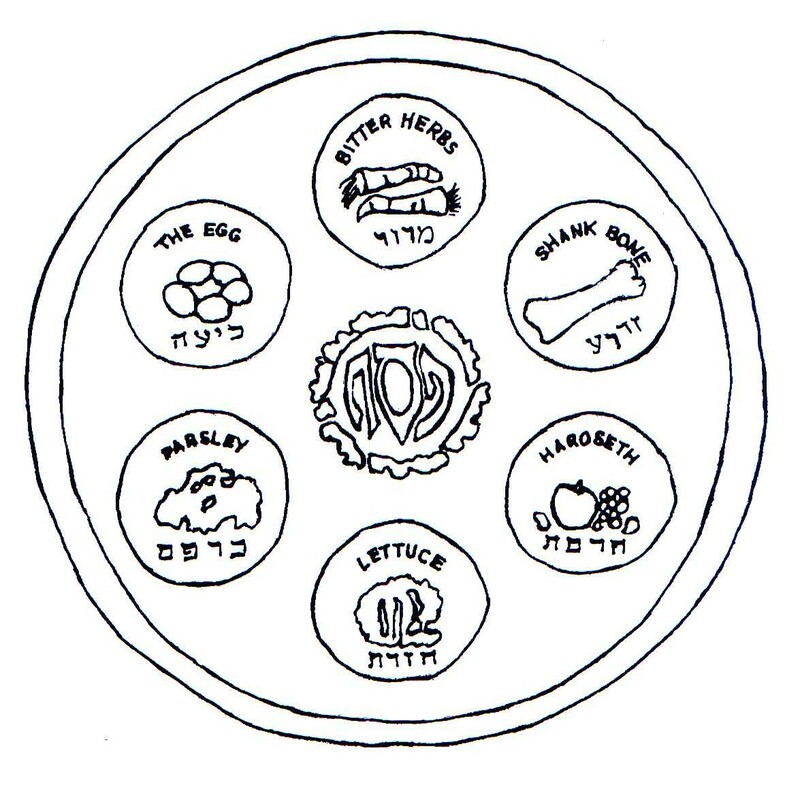 The first seder will be on Friday, April 6 — less than two weeks away. And on the second night of Pesach, we begin the process of Counting the Omer, counting each of the 49 days between Pesach and Shavuot, between the festival of our freedom and the celebration of the revelation of Torah at Sinai, between liberation and covenant. During the Omer count, I’ll be posting a series of daily Omer teachings on the CBI From the Rabbi blog, which I hope will help enrich and sanctify this special corridor in time. (If you use a blog aggregator or feed reader, you can subscribe to the Omer postings at this feed URL; alternatively, you can choose to receive emails when posts appear on the From the Rabbi blog — click on the “sign me up” button under “Follow blog by email.”) But if you’d like some resources for Counting the Omer on your own, here are four of my favorites. Three are newly-published books, and the fourth came out in 2010. 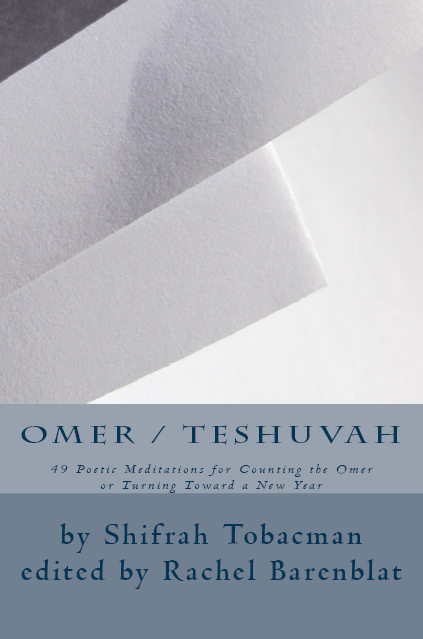 This collection of poems by Shifrah Tobacman offers meditations for each of the 49 days of the Omer count, from Pesach to Shavuot, from freedom to revelation. These poems will open your heart and your spirit as you move through the gates of each day. And the book is also designed to be read in the other direction (like a Hebrew book, right to left) during the Omer Teshuvah, the 49 days between Tisha b’Av and Rosh Hashanah. The collection is edited by Rabbi Rachel Barenblat, author of 70 faces: Torah poems (Phoenicia publishing, 2011) and features photography by Elizheva Hurvich. The Omer Calendar of Biblical Women is a journey through the seven weeks between Passover and Shavuot. According to the Kabbalah, each of these forty-nine days embodies a unique combination of Divine attributes, or sefirot. Each day of this calendar features the story of a biblical woman who embodies the unique spiritual dimension of that day of the Omer. The calendar also contains illustrations from classical paintings and modern midrashic art. The author of the calendar is Rabbi Jill Hammer, PhD, author of Sisters at Sinai: New Tales of Biblical Women and The Jewish Book of Days: A Companion for All Seasons. Rabbi Hammer is Director of Spiritual Education at the Academy for Jewish Religion. Shir Yaakov Feit, Creative and Music Director of Romemu, New York City’s Center of Judaism for Body, Mind, and Spirit, designed the calendar. In this book, Rabbi Yael Levy gathers wisdom from Psalms and the Jewish mystical tradition into a unique Mindfulness approach to the ancient Jewish practice of Counting the Omer during the 49 days between Passover and Shavuot. This 96-page, full-color guide includes the Omer blessings in Hebrew and English, daily teachings and intentions, pages for reflections and photographs to inspire meditation. Daily suggestions for action deepen the experience of counting each day and making each day count. Using insights gained from more than a decade of her own spiritual exploration with the Omer, Rabbi Levy has created a guide for spiritual growth for beginners and those who have experience with this practice. Rabbi Yael Levy’s Approach to mindfulness is deeply rooted in Jewish tradition. She is the founder of A Way In, A Jewish Mindfulness program based in Philadelphia that offers a range of activities from meditation and contemplative Shabbat services, classes and retreats, as well as online teachings and practice. She is a spiritual director for rabbinical students in both the Reconstructionist and Reform movements as well as in private practice. Her Mindfulness teaching grows out of her deep personal commitment to spiritual practice and a passionate belief in its potential to change not only individuals but the world. 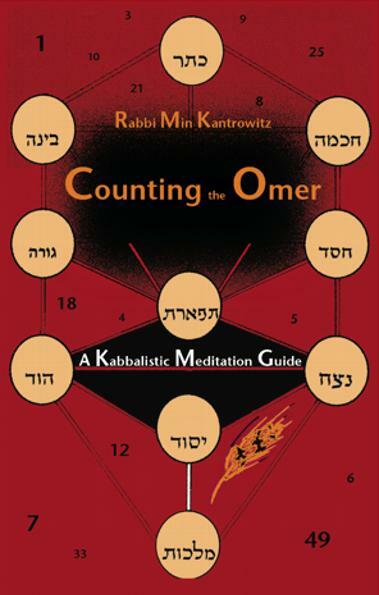 Counting the Omer is a Kabbalistic meditation guide to understand the in-depth meanings of each of the forty-nine days between Pesach (Passover) and the Shavuot celebration of the revealing of the Torah. Rabbi Kantrowitz follows Kabbalistic guidelines to show how the unique values of the sephirot interact each day, giving the reader insight into the strengths of the day. Through this guide the reader is led to meditate on the mystical qualities of life and self. Rabbi Min Kantrowitz is the Director of the Jewish Community Chaplaincy Program of Jewish Family Service of New Mexico, which provides spiritual support and pastoral care services to thousands of unaffiliated Jews. Rabbi Kantrowitz also directs the Albuquerque Community Chevre Kaddisha, facilitates grief support groups and conducts Healing Groups for Jewish survivors of domestic abuse. She is a sought after speaker and teacher, having conducted services, workshops and lectures in Europe, California, Montana, Arizona, and across New Mexico. She received her Rabbinic Ordination in May 2004 from the Academy of Jewish Religion in Los Angeles. In addition, she holds a Bachelors Degree in Psychology and Masters Degrees in Psychology, Architecture, and Rabbinic Studies, as well as a Masters of Science in Jewish Studies. And, if visual art speaks to you more than does text, try D’vorah Horn’s Omer Series of paintings, available on beautiful printed cards for $36. For those who are interested, here’s the Torah study text we studied this past Shabbat. The sages interpreted this (in the Talmud, tractate Shabbat) to refer to the 39 forms of labor. As it is said, “these [are the things]” — this hints at externals [external forms of labor rather than internal ones], as the Ari (of blessed memory) noted in his commentary on the verse (Lamentations 1:16) “For these things I weep, etc,” arguing that we need to heal them by means of work. When we say “to do,” [as in: “these are the things which God commanded that you should do,”] we’re speaking in terms of healing. [So: what Torah is really saying is, these are the things which God commanded we should repair / heal.] And that’s in secular/profane/workday time; but on Shabbat one doesn’t do the work of clarifying externals, and therefore doing work is forbidden. And on Shabbat, when they weren’t doing work, only (engaging in) mitzvot of speech, such as Torah and prayer — for this is the essence of Torah and prayer — on Shabbat, by means of this, they repair the world of work. And this is “Which God commanded them to do,” as it is said, repairing the world of making/doing. What is Kedushat Levi saying about external work vs. internal work? Which one do we do during the week, and which on Shabbat? How do you like his idea that when we say “doing,” we’re really talking about healing? What do you make of the idea that in building the mishkan, we were repairing the world of our speech? How about the idea that through Torah and prayer on Shabbat, we repair our workweek?